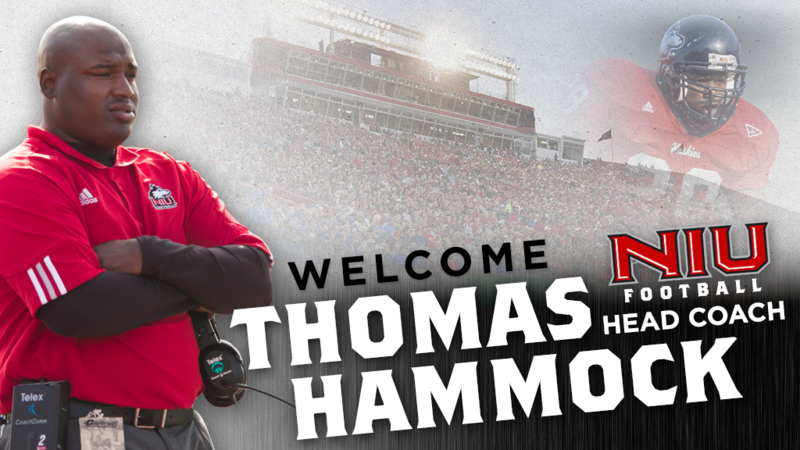 Thomas Hammock, a former Huskie player and assistant coach, returns home as the 23rd head coach in the history of the Northern Illinois University football program, NIU Associate Vice-President and Director of Athletics Sean T. Frazier announced on Friday. Hammock returns to NIU after spending the last five seasons as an assistant coach with the Baltimore Ravens and is the first African-American head coach in NIU football history. Hammock earned his bachelor’s degree in marketing from NIU in 2002 and a master’s in educational leadership and policy analysis from Wisconsin in 2004. He and his wife, Cheynnitha, also a NIU alum, have a daughter, Tierra, and a son, Thomas Douglas.